Chuseok is one of the major holidays in Korea. Many Koreans go back to their hometowns as school and work are closed for the first three days of Chuseok. It's good to know some of the Korean customs when in Korea and it's Chuseok. Also known as the Korean Thanksgiving, Chuseok is a time for many Koreans to visit their hometowns to spend quality time with their family and friends. 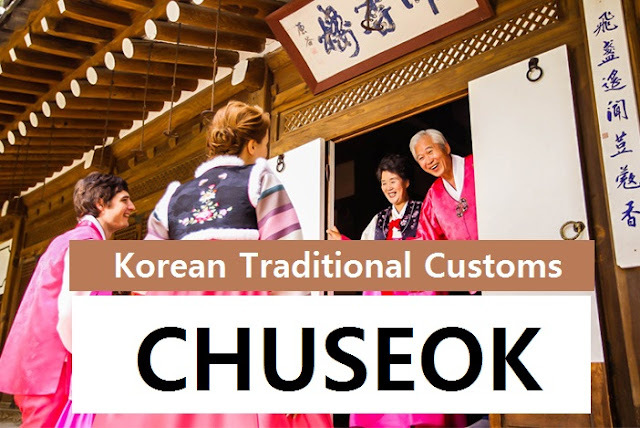 Chuseok also provides a good opportunity to enjoy traditional cultural experiences for foreigners in Korea. On the first morning of Chuseok, the head of the family gather his household members to hold a memorial service for their ancestors. This service is called charye. Fresh rice, alcohol and songpyeon, usually prepared on an altar, are offered in honor of their ancestors. 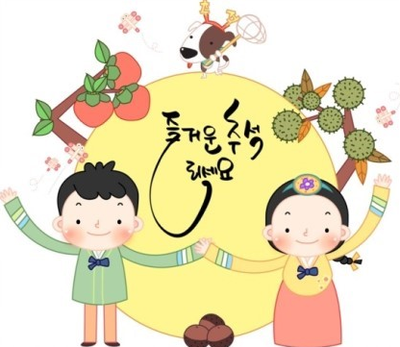 After the charye, the family members eat delicious food together, play games or enjoy traditional performances. Songpyeon is prepared with rice powder that is kneaded into a size that is a little smaller than a golf ball, and then filled with sesame seeds, beans, red beans, chestnuts, or other nutritious ingredients. When steaming the songpyeon, the rice cakes are layered with pine needles to add the delightful fragrance of pine. 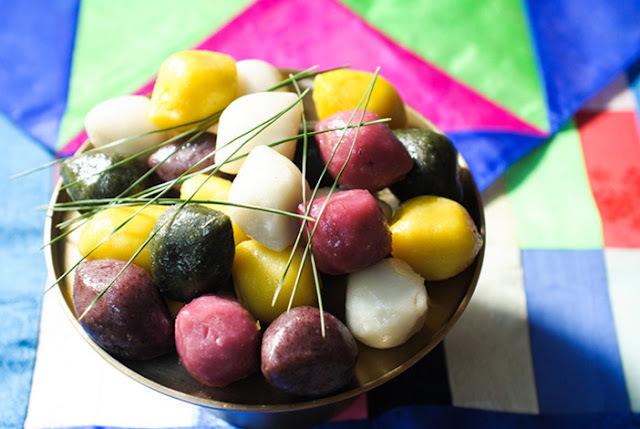 It is an old tradition for the entire family to make songpyeon together on the eve of Chuseok. Fun fact: Korean elders say that a person who makes beautifully shaped songpyeon will meet a good spouse or give birth to a beautiful baby. 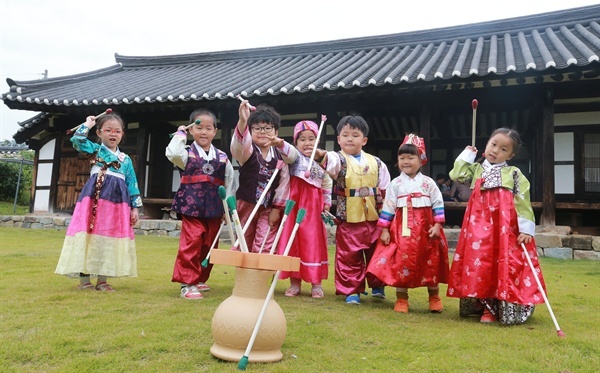 Like a child living in the older era, traditional games like tuho, yut and neolttwigi are enjoyed by everyone during Chuseok. These games are like time machines because they take Koreans back to their childhood days. 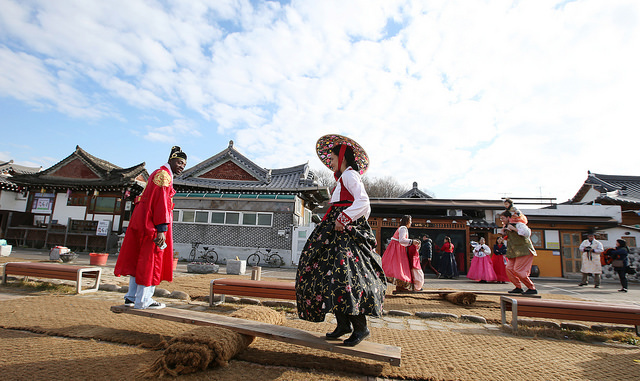 Neolttwigi is the traditional Korean version of a seesaw. A long board is placed on a rolled-up straw mat and then players stand on one end. What makes it more fun is that when one of the player jumps, it launches the other player in the air. Tuho originated from ancient China. 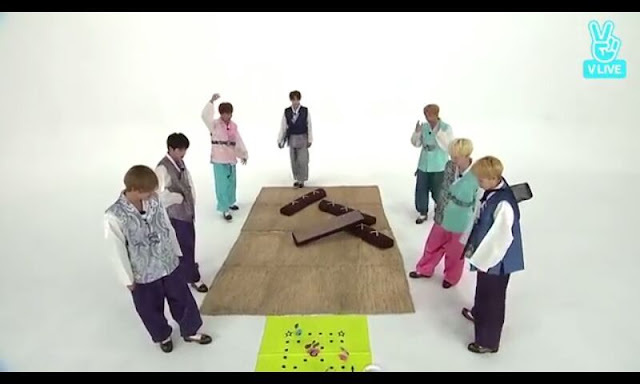 It is one of the popular traditional Korea games because it is so easy that most Korean variety shows play this game. It can also be seen on Korean historical dramas. Tuho is a game for sharp shooters as you have to aim and toss an arrow or stick into a narrow ring stuck on a wooden jar from a certain distance. The player with the most number of sticks shot in the rings wins the game. Yut or yutnori is a traditional Korean board game that consists of a "stick dice," four wooden sticks that are flat on one side and rounded on the other. Each player or team takes turns to throw the yut sticks. For non-Koreans, this may be a tricky game. Five combinations of the "throwing sticks" are possible: do, gae, geol, yut and mo. If a player obtains a yut or a mo, they're allowed to throw the sticks again. When a board piece lands on a spot occupied by an opponent, it's returned to the start position and there's a new opportunity to throw a yut. If a piece lands on a spot occupied by a piece from your own team, the pieces can travel together as one on the next turn. The throwing stick combinations determine how many spots are moved each turn, and the team which moves all four pieces around the board first wins. Ssireum is a one-on-one wrestling match held on a circular sand pit that requires strength and skills. Chuseok is made even more colorful with different performances that depicts the cultural characteristic of Korea. Samulnori, talchum, ganggangsullae, are rituals performed in tradition of thanking the gods for the good harvest. Nowadays, these are still performed, not only as a ritual but as a form of entertainment. 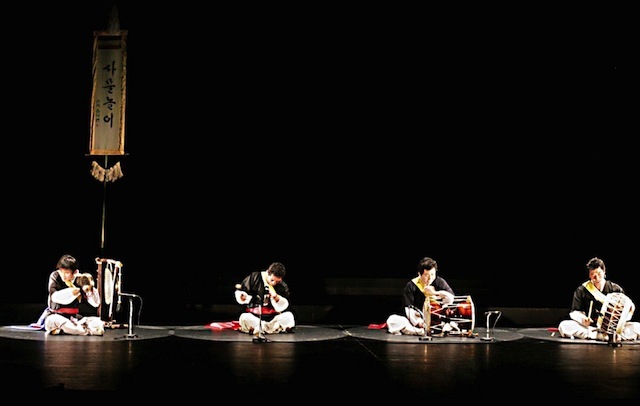 Samulnori is a traditional percussion quartette that consists of four main instruments: Puk, Janngu, Jing and K'Kwaenggwari. Each represents an element of nature: Jing as the wind, Janggu as the rain, Puk as the clouds and, K’kwaenggwari as the lightning. Samulnori used to be the farmer’s music (nong-ak), and includes not only music but dancing to celebrate harvest times. The music also stems from the shamanistic tradition of utdari pungmul, which is performed on these same instruments together with singing and wind instruments. In its modern incarnation, samulnori relies solely on the four instruments featured here. Talchum originated in Korean villages as part of shamanic rituals that had evolved to cleanse houses and villages, offer protection and good harvest. It then became a form of popular entertainment. It was once performed at the court – during the Koryo dynasty, the Office of Masked-Dance Drama (Sandae Togam) supervised such dances, and these dances may be performed at royal banquets. 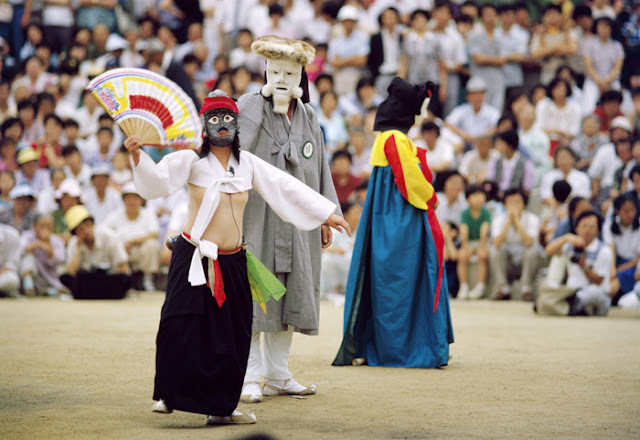 Mask dance dramas share fundamental characteristics, even though they vary considerably according to region and performer. Their basic themes are exorcism rites, ritual dances, biting satire, parody of human weaknesses, social evils and the privileged class. They appeal to the audiences by ridiculing apostate Buddhist monks, decadent upper classmen, and shamans. Another popular theme is the conflict between an old wife and a seductive concubine. 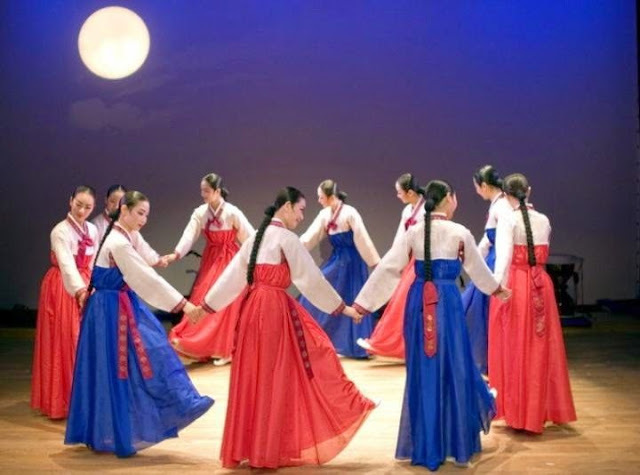 Ganggangsullae is a 5,000-year-old Korean dance that was first used to bring about a bountiful harvest and has developed into a cultural symbol for Korea. Korea’s traditional society was a male-dominated society, and young women were not allowed to sing loudly or go out at night. But women were allowed to sing and dance by doing “ganggangsullae” in night and give vent to their frustration at Chuseok. Women could enjoy the atmosphere free from normal restriction at festival. Fun fact: In the 16th century, during the Japanese invasion of Korea, Admiral Yi Sun-sin ordered women to do this dance in military uniform to intimidate the Japanese. The women were said to have dressed in military uniform and danced on Okmae-san. The Japanese scouts thus overestimated the strength of the Korean troops.